The term “outsider art” was given by critic Roger Cardinal back in the 1970s to describe artistic production outside the “mainstream”. But as a small but powerful display at the Julian Hartnoll gallery in St James’ reveals, this kind of art can be more moving, deeply felt and a highly skilled form of creativity – and can challenge the “mainstream” on its own terms. A group of works by the Swedish artist Linda Persson provide an insight into thoughts and imagination ranging from the deeply personal to the mythological. Persson, who died tragically young in 2007, had an immense drive to express her ideas, through writing, poetry but primarily through painting. One of her most frequent themes was the human hand: sometimes entwined, sometimes drooping, sometimes brown, sometimes shocking pink. Persson’s depictions of hands have a vulnerability and intensity combined with strength and energy. Her paintings of hands are clear and simple images, but with hidden, symbolic meanings we can only guess at. Like our real hands, they externalise inner thoughts and help to connect in a direct way with what makes us human. More complex paintings such as Creature have a mythological quality about them reminiscent of Joan Miro and Ken Kiff. Spindly, long-limbed creatures stride through a landscape. A huge mouth devours a plant. Portrait in Black is a charcoal drawing with rhyming forms recalling embryos. 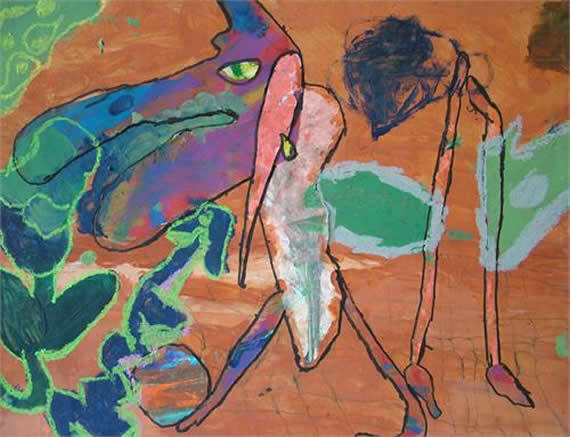 As in her pastels, Persson endows these figures with a direct energy. We are drawn to her strange and often archetypal characters for reasons which are difficult to grasp. 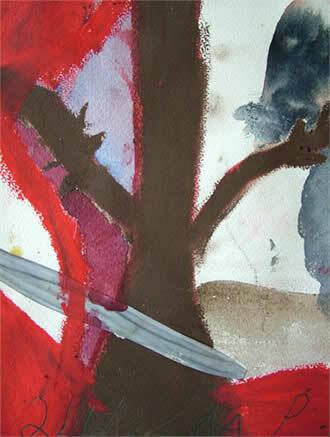 She has the ability to use colour, materials, and calligraphy in diverse and suggestive ways, as for example in Collage III: a brown tree branches upwards, bisected by a collaged sword. Reds, purples and flowing greys give this collage rhythms and a sense of mystery. Persson’s work, as that of her colleagues at the INUTI studios, connects strongly not only with other Outsider Art but with the history of 20th century art, from Picasso and Paul Klee. In Britain Roger Hilton, Ken Kiff, Frances Blane and Tracey Emin have worked in this vein. There may not appear to be a direct connection between law and the possibility of art. But, in Sweden, thanks to the implementation of a law passed in 1993 and pioneering individuals, people with autism and other forms of intellectual disabilities have the opportunity to become professional artists. The law in question goes by the name of LSS. It gives people with intellectual disabilities the right to support and a fulfilling daily activity of their own choice. Local councils must provide a full range of care free of charge and the individual concerned must have the opportunity to request an individual plan and influence what is included in it. 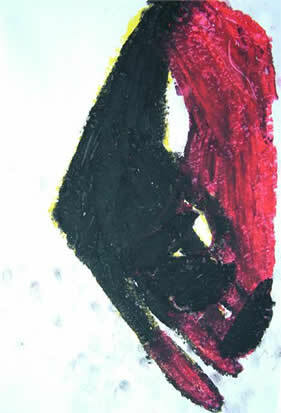 In practice, this has meant that those affected by autism – certainly in many cases – have benefitted from unique forms of care as well as the chance to acquire skills and practise different types of artistic activity. A look at the website of the INUTI foundation in Stockholm, which was set up in the 1990s by, amongst others, Helena Petersson, gives an idea of an amazing group of artists who have flourished and developed their talents in a truly professional way. The crucial difference here is that those affected by autism and other disabilities are not doing “art therapy”. Instead they are provided with studios and the necessary materials for their work and associate with each other as colleagues rather than patients.